When someone says Cancun, you probably hear the words: Spring Break. In March and April, the town is taken over by college kids looking to party. If you are one, were one, or want to hang out with that crowd, then get to Cancun in the spring. But for everyone else, the best time to go is before or after the spring break crowd when things are a little less busy but still fun. 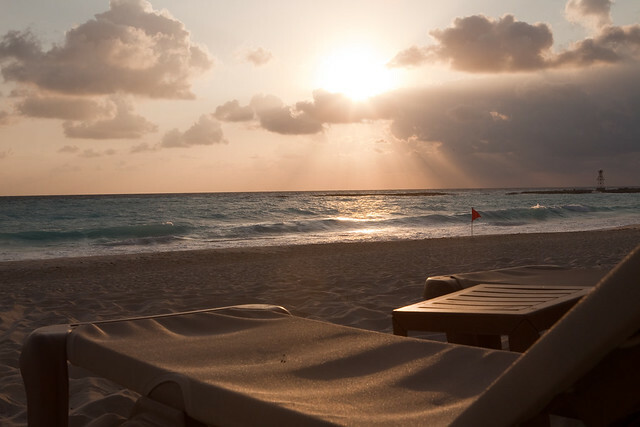 Cancun is a town for beachgoers, partiers, and tourists no matter what time of year you go. Despite that, you don’t have to party all the time. From Cancun, you can book diving trips, explore a nearby Mayan pyramid, or take a day trip to a quieter beach in a nearby town. Nightlife in Cancun centers on clubbing. You can easily start with happy hour at a hotel or restaurant (or with a drink on the beach) and then hit up a club later on and party all night. Nightclubs tend to be pricey, but many of the most expensive ones book live music. Everyone wants to cash in on the nightlife in Cancun, so if the clubs are too crowded or too pricey for your taste, find out what specials are happening and which hotel bars have live music. Many hotels try to entice those staying at other hotels to come in for music and a drink. Some chain restaurants (think TGI Fridays and Hard Rock Café) in Cancun also transform from family friendly dining by day to bar and club at night, but they tend to be less expensive than an exclusive nightclub. You can also get tickets for nighttime tours and bar crawls that will take you to some of the hottest places in Cancun and often offer drink specials or free drinks as part of the ticket. Cancun was once a quiet, out of the way beach. But its beauty, white sands, and blue waters betrayed it. Tourists started coming, told their friends, and within a few years tourism here exploded. Cancun is now a resort town certified by the United Nations World Tourism Organization, which promotes responsible tourism and focuses on building tourism as an industry in developing countries. Because of the UNWTO, the tourism industry is large and focused here. It’s easy to book all-inclusive stays at hotels, make transfers from the airport to your hotel, and book guided tours to nearby attractions.